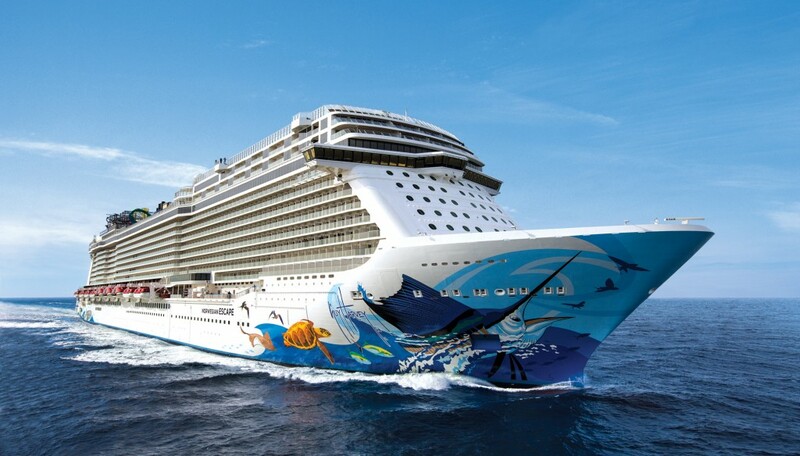 Cruise ships offer an incredible experience where the journey is the vacation, and when you want to escape the everyday stress, you want to sail away on Norwegian Escape. Departing from New York City, this ship gives you an extraordinary onboard adventure. We dare you to try everything – or nothing at all. However you prefer to sail, this ship has the experience for you. Norwegian Escape dazzles with so many onboard activities that you may not be able to fit them all in. (We couldn’t even do it in this blog!) Twenty decks bring you Broadway style shows like After Midnight, smash-hit musical highlighting the Harlem’s Cotton Club and its storied history. Don’t miss out on For the Record: The Brat Pack, a one-of-a-kind theatrical rock ‘n’ roll concert experience, set to the songs of favorite 1980’s movies. Laugh out loud with 12 sidesplitting shows of the Levity Entertainment Group at Headliners Comedy Club, and for a truly robust evening, Wine Lovers the Musical offers wine tastings along with musical comedy. How about some excitement? Head to the top deck for Aqua Park with tandem water slides, free falls, family rides, pools and hot tubs. At 678 Ocean Place, you’ll find three decks of nonstop action, including bars, lounges, NCL’s biggest casino, and specialty restaurants. Walk the Plank and zip over the seas in an exhilarating ropes course. Then refresh and relax in the chilly snow room. Take to the Waterfront, Norwegian’s promenade with shops, bars, and specialty dining for a relaxing evening. Sit back with a drink in your hand and good company, and enjoy an experience you can’t have anywhere else, the pleasure of the unobstructed sunset at sea. Of course, that’s only what you can do on the ship. Once you dock at your destination, you’ll also have shore excursions to enjoy in paradise, AKA Caribbean, the Bahamas, and Florida. Pace yourself. With 25 dining options to choose from, you’re going to want to try as many as you can during your duration at sea. Complimentary dining includes contemporary cuisine in stunning dining areas with floor-to-ceiling windows, so you can enjoy the view along with your meal. For a more intimate experience, dine at O’Sheehan’s Neighborhood Bar & Grill, an Irish pub featuring favorite comfort foods like chicken pot pie, chicken & waffles, and fish ‘n chips, also included in your complimentary dining package. Indulge with a specialty dining package, and enjoy 11 exquisite restaurants. Savor slow-roasted meats carved tableside at the authentic Brazilian steakhouse Moderno Churrascaria, and feel like you are dining in Paris itself with sidewalk-style dining at Le Bristro French Restaurant. For small plates such as Queso y Charcuterie, stop into Pincho Tapas Bar, and make sure to order the sangria. Is an NCL voyage complete without a meal at Cheeseburger in Paradise with a Who’s to Blame Margarita? We think not. With so much to see and do on Norwegian Escape, you’ll also want some time to yourself and those with you. Norwegian Escape offers a wide variety of places to recharge for another day of excitement, starting at the studio (with no single supplement), a mini-suite featuring a private balcony, a Spa Balcony with complimentary access to the Thermal Suite at the Mandara Spa, or even the exclusive Haven. This pampering section of the ship features 24-hour butler service, a private sundeck, private restaurant, and accommodations featuring bedrooms and penthouses. Are you ready to cruise on Norwegian Escape? Together with GOGO Vacations, your local travel agent will get you there.